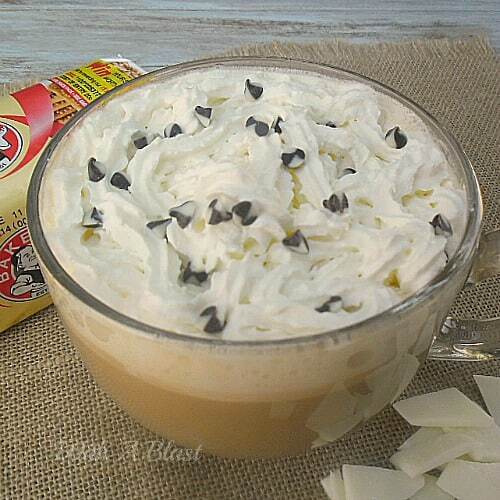 White Chocolate Latte is the BEST latte to make at home, especially for white chocolate lovers ~ no need to run to the coffee shop ! I am not a coffee drinker. Tea, yes, especially Twining’s Vanilla Tea, but very rarely coffee. 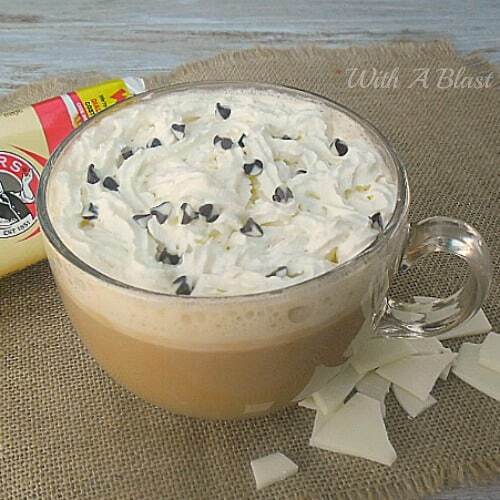 Quite the different story with iced coffee or this white chocolate Latte ! During Summer I would enjoy an iced coffee once a week, maybe. Other than that, I only keep coffee in the house for my daughter’s boyfriend, as he is a huge coffee lover. I have seen him enjoying a cup just before bed late at night. Now, that won’t work for me at all – if I have coffee, any coffee (except of course decaf) any time after 1 – 2pm in the afternoon, I would not get any sleep at all that night. Lattes are different. I know, it is coffee, but so much more creamy, tasty, milky and so many variations ! I only have one of these now and then as it contains strong brewed coffee, which again also do not play nicely with my medications. Well, for this White Chocolate Latte, I completely forget about my hang-ups about coffee and even the small side effects it may )or may not!) have with my meds. I'm not a coffee drinker either but you've won me with the white chocolate. Not a coffee drinker either, but it does look tempting! oh i am a tea drinker too but this does sound delish! I will have to try it 🙂 I love white chocolate so thinking yum!! This sounds like a dessert, almost! I drink coffee and tea both but probably more coffee as we have it every morning. I have been enjoying iced coffee more lately this summer in the afternoon but I do the decaf or I wouldn't be able to sleep at night either. Thanks for the recipe – pinning. This is totally a dessert drink — one that I would drink right up and probably ask for seconds 🙂 Yum! Oh goodness I'm a sucker for sweet and this sounds and looks amazing! OH MY GOODNESS! I LOVE homemade coffees! Pinned! I love your White Chocolate Latte! Thanks so much for sharing your awesome recipe with Full Plate Thursday this week. Have a great weekend and come back real soon! I love coffee and this sounds absolutely delicious, Linda! Yummy…I want to make one of those. New follower from Home Cooking. Have a great week. I am not a coffee drinker at all, but this looks so good and tasty, I may have to become one! I would love if you would stop by and link this up to my new blog party, Celebrate It! It's all about how we celebrate the everyday things in life! Hope to see you there! I'm like you, I don't really drink coffee at all, although I did like it when it had whiskey in it….lol. This I think I could definitely give a try. I do like coffee flavoured things (weird I know), so I reckon as this is not technically 'coffee' my taste buds would agree. Besides…it has chocolate in it!!! I love coffee and this is such a delicious way to serve it! 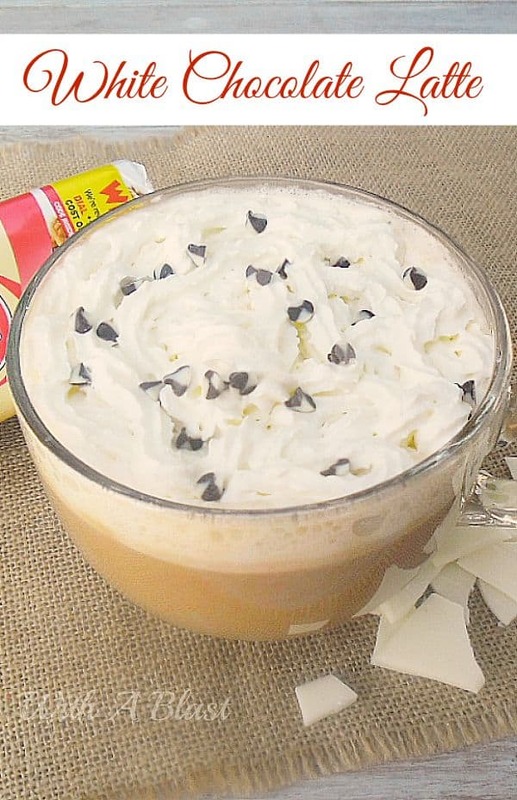 Your White Chocolate Latte looks amazing, Linda! Pinned and tweeted. Thank you for sharing with the Hearth and Soul hop. This looks so good! I love coffee, and this looks like coffee and dessert all in one delicious cup! This looks delicious. Thanks so much for sharing with Wednesday's Adorned From Above Link Party. I am very much a coffee drinker. 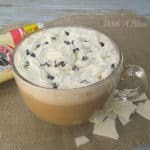 I tend to lean towards cafe au lait, but this White Chocolate Latte looks like an indulgent treat! Thank you for sharing, Linda.